I'll be honest. I'm not a fan of Greta Van Fleet, the trendy young band of the moment who sound more than a little bit like Led Zeppelin. That said, I don't begrudge them their success. The singer does a mean Robert Plant impression, the band can play, and in the greater scheme of things there's plenty of music out there that's worse. However, I am tired of hearing about how GVF are supposedly “saving” rock n roll. Or even more ludicrous yet, given their retro affectations, that they are the “future” of rock n roll. The implication, of course, is that there aren’t any other new(ish) bands playing genuine honest-to-goodness rock music in the classic mold. 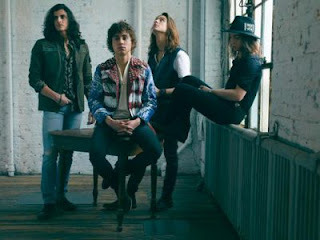 If you’re really starved for new rock music and all you can find is Greta Van Fleet, you're not looking hard enough. But don’t worry, Utter Trash has done the looking for you. Leaving aside the extremes of death/black/nu/doom and other flavors of metal on one hand, and indie rock that seems to have left out the “rock” part of the equation on the other, I’ve compiled a collection of ten videos by 10 artists who relesed their debut album in the past 10 years. They prove that the state of rock was and is just fine with or without Greta Van Fleet. Music fans just need a little help finding that out. 1. Blood Ceremony – Echoes of Jethro Tull, Black Sabbath, Fairport Convention, and Uriah Heep abound in this Canadian band. After giving them a listen you may just conclude that more rock bands should use flute and violin. 2. Chicano Batman – A blend of psychedelia, soul, funk, and rock with a Brazillian flavor. The closest comparison that I can think of is Santana, but more in terms of their spirit than their sound. 3. The Church of the Cosmic Skull – I’m assuming this British band’s religious cult image is a schtick, but then again, maybe it isn’t. Regardless, their blend of Fleetwood Mac, Deep Purple, Abba, Black Sabbath, and Electric Light Orchestra is enough to make a convert out of me. 4. Foals – British band Foals tend to be labelled/sold as indie rock, but to my ears it’s just straight forward rock. If you like harder rocking classic bands in the ballpark of The Who, this might grab you. 5. The Growlers – Psychedelia, Lee Hazelwood, and jam rock come together in The Growlers west coast beach bum sound. They’ve got a strong underground following, but given how catchy their songs are, it should be bigger. Light one up and give ‘em a listen. 6. Lucifer –Lucifer’s sonic palette has broadened from the Sabbathy doom of their debut to the point that they’re more of a seventies-inspired “classic rock” band now. And that’s not a bad thing for this European combo. 7. Night Flight Orchestra – A bunch of Swedish metalheads playing unapologetic late seventies/early eighties AOR rock in the vein of Toto, Journey, and Jefferson Starship. I expected it to be a joke, but the way this band got their hooks into me is no laughing matter. 8. Savages – This powerful post punk quartet from England and France recalls Siouxsie and the Banshees, Bauhaus, The Cure, and Joy Division. Not only do they nail the sound, they also write songs worthy of their influences. Might not appeal to the mainstream, but not out of the question, either. 9. Screaming Females –Only one female in this power trio, but who’s counting? Good songwriting, killer vocals, and stellar musicianship are what really matters. Why isn’t this band huge? (note – the band self-released 2 albums before my 10 year cut-off mark, but they weren’t widely available until 2009, so I’m allowing it). 10. Zeal and Ardor – This odd project attempts to meld black (as in Satanic) metal with black (as in race) roots music. Surprisingly it works pretty good One can easily imagine songs like this one, where the black metal side is dialed way down, appealing to a more mainstream rock audience.